When Harold Fry receives a letter from an old friend who is dying of cancer, he pens a short response back, but when he reaches a postal box to mail it, he decides to continue walking. And keep walking, all the way from the south of England to the north. The unlikely hero of Rachel Joyce’s brilliant novel, “The Unlikely Pilgrimage of Harold Fry,” is convinced his friend Queenie Hennessy, who he has not seen in 20 years, will stay alive as long as he is walking toward her. Dressed in a tie and yacht shoes, the 65-year-old former sales rep, retired from work, from love and even from life itself, is an unlikely long-distance walker; his wife reminds him that the farthest he had ever walked was to his car. Harold Fry never refers to his walk as a pilgrimage, which would suppose he deliberately set off on a quest for higher meaning. He never calls his journey a hike, either, which would suggest route-planning, wearing sturdy hiking boots, and taking along the Ten Essentials. 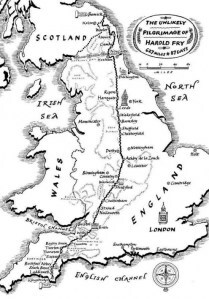 Knowing nothing of nature or hiking, Harold Fry nevertheless walked more than 600 miles across England. It takes him 87 days to walk from his home in Kingsbridge to the hospice in Berwick-upon-Tweed, a journey of more than 600 miles, including detours and directional miscues. Along the way he has plenty of time to think about things, as does Maureen, the wife he left behind. How did their love grow cold? Could they have been better parents to their son, who went way off the rails? Is there a path to renewal for each of them individually, and for their marriage? Let’s be clear, though, this novel is not some New Age-y confessional by a self-absorbed character, who uses a long walk to reveal more than you ever wanted to know about past mistakes and relationships-gone-south. Harold opens himself to the wonders of the countryside and the kindness of strangers but holds onto his British reserve and only gradually reveals the secrets of his soul. But this is no walk in the park and Joyce also reveals the painful realities for a long-distance walker—sunburn, blisters, dehydration. And yet, with compass pointed north, Harold presses on, meeting one colorful character after another, each unlocking long-repressed thoughts and feelings and bolstering his courage to hike on. Unsentimental, yet deeply moving, “The Unlikely Pilgrimage of Harold Fry,” is a great read and a tale that appeals to the hiker in all of us. Read it, and Hike on.